You have probably heard the name, and likely seen the plant, but if you are an absolute beginner, just starting out with your first garden, then you might be wondering what all the fuss is about, and why so many people have so much to say about this plant. It’s green, right? – and it must be big? If you just took over a garden, or have a brand new one to plant, then Thuja Green Giant is almost certainly your best friend. This plant is an evergreen – it stays green all winter – and it is a conifer, that is, it doesn’t have flowers, but instead has structures called cones. This means that it is related to pine trees, which you probably recognize, although it looks very different. It has tiny leaves that cling to the stems, so it looks like divided green branches, all growing together. 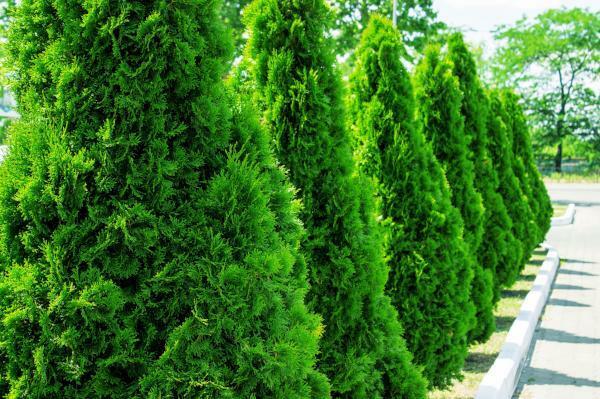 Why is Thuja Green Giant the Top Choice Evergreen? The main reason is its speed of growth – 3 feet a year is common in the early years, and it will put on at least 10 feet in the first 7 years – and that is proven by research. That is faster than any other evergreen tree. Period. Other reasons are how tough this tree is in many different climates, soils, and growing conditions. It has no significant pests or diseases, and deer usually leave it alone too. What’s not to like in all that? What Is Thuja Green Giant Like? Thuja Green Giant forms an upright, green bush that is always a rich, healthy green color, through all the seasons. That is why gardeners like to use it for hedges and screens, because it always blocks whatever it is you want to block – neighbors, a highway, another home, or an ugly view. It naturally grows upright, and it stays green right to the ground for many years, which is great, because it will keep blocking that view at eye-level. That doesn’t mean it stay small, as it can eventually grow 30 feet tall and 12 feet wide – and it won’t take long to do it. The first thing to remember is that if you are planting this tree and don’t plan to trim it, make sure it has room to grow. Plant it at least 6 feet away from walls, fences, existing plants, and your house. Don’t plant it beneath a window, there are lots of other dwarf evergreens for spots like that. Thuja Green Giant will stay dense and upright, if you trim it, or if you don’t. Untrimmed it will grow taller, but you can make a very good maintenance-free barrier from it with no trimming, just so long as you have enough room for it to grow to full size. Where Will Thuja Green Giant Grow? Thuja Green Giant grows anywhere from zone 5 to zone 9. If you don’t know your growing zone, you can enter your postcode on this Department of Agriculture site and quickly find out. If it turns out you live in a colder zone than 5, use Emerald Green Arborvitae instead – it looks similar and is hardy in the coldest places. As for soil, don’t worry, this tree will grow in just about any kind of soil, if it is not constantly wet. Even in wet places, if you plant your trees on a ridge of soil, they will usually adapt and thrive. This tough tree grows best in full sun, but it will also grow well in partial shade – that is, either a place that gets a few hours of sun a day, or that is in light shade from deciduous trees or buildings. How do I Make a Hedge or Screen with Thuja Green Giant? For a hedge that will be solid in just a few years, space them 3 feet apart. If you are not in too much of a hurry you can space them up to 5 feet apart. Whatever you choose, space them evenly. For an untrimmed screen, space them at least 5 feet apart, and you can increase that to as much as 10 feet, if you don’t need a solid barrier in a hurry. Remember to allow room for them to grow wider, so allow at least 3 feet for a trimmed hedge, or 6 feet for an untrimmed screen, away from a path or driveway, or your property boundary. If you are not used to planting trees, don’t worry – it’s easy. Prepare the ground first, by digging the ground deeply, by hand or with a roto-tiller. If you are planting just one or two trees, then dig an area about 3 feet across, a spade deep, and plant in the center of that. For a hedge or screen, it is best to dig a full row, but you can just make individual holes instead. If you use a roto-tiller go over the ground several times to till it as deeply as you can. If there are a lot of weeds, try to rake out as many roots as you can. It is best if you can add some organic material at the same time, digging it well into the soil. There are lots of suitable materials – garden compost, rotted animal manures like cow, sheep or horse, mushroom compost if it is available where you live, and peat moss or rotted leaves are good too. Use a plant starter fertilizer as well, to activate the soil and give your new trees the nutrients they need to get off to a good start. When it comes time to plant, water your plants well the night before, and dig the holes. If you prepared the soil well, the hole only needs to be as deep as the depth of the pot. Slide the pot off the roots and take a look. If there are roots wrapping around and around inside the pot, take a sharp knife and cut from top to bottom an inch deep, through those roots at three places around the pot, and also make a cross across the bottom. Now place the tree into the hole, adding firm soil beneath it until it is at the same level as it was in the pot. Put back some of the soil, and firm it down with your feet around the root ball. Fill the hole to the top with water. Let it drain away and then put back the rest of the soil, firming it down again around the roots. Water again if the surrounding soil is dry, and you are all done. How do I Take Care of Thuja Green Giant? Caring for this tough tree is easy. For the first year or two, remember to water once a week all season, stopping when all the leaves are off the trees. In warm areas, if winter is dry, water from time to time. After those early years, if you water regularly you will get lots of growth, but established plants will survive all but the most extended drought. Trim or don’t trim – the choice is yours. Now that was easy. Probably the most fundamental aspect of a garden is its boundaries. These may be along the property line, or they may be internal divisions, separating one part of the garden from another. For some gardeners they are just the beginning, to be followed by trees, shrubs, beds, and a complex garden design. For others, just a lawn and a shade tree are all that needs adding, once that important privacy is found. When it comes to those boundaries, there is an on-going debate about how to make it – should I erect a fence, or should I plant a hedge? As well, if a hedge is chosen, then what plant should it be? 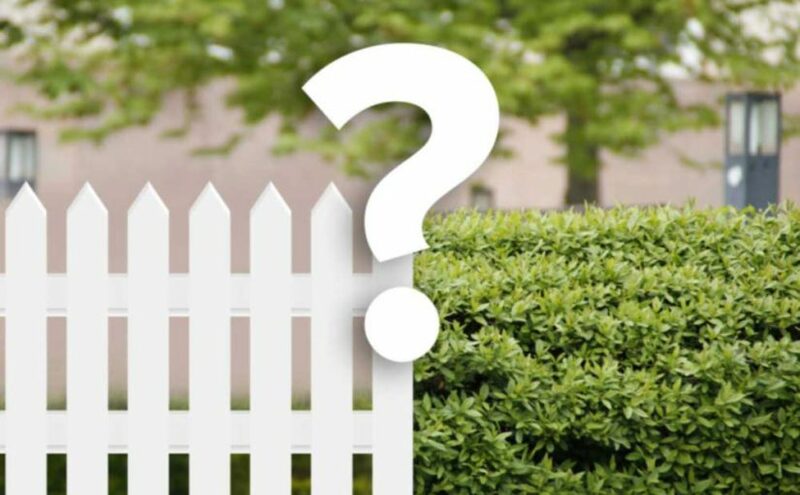 Both fences and hedges have their cheer-leaders, and there are pros and cons for both, so let’s consider them, to help you make the best decision for yourself. Probably the major reason many choose a fence is that once done, its done. That is to say, it’s finished the day it goes in. Full height, solid barrier, there is nothing more to do. Installation is often quick, using a post-hole driller, and panels attach quickly too. A day or two, and a professional will have it all done. Even if you save money by doing it yourself, it probably will only take a couple of weekends, perhaps with the help of some friends, and the job is done. If you choose a suitable material, perhaps good-quality vinyl, or coated metal, then you can be looking at 10 or 20 years without any maintenance. Wooden fences have a shorter life, and they are cheaper too, unless you choose high-end lumber for it. Fences are a good choice for a smaller space, particularly if you don’t have much space between your property and your neighbors, since it takes up very little room. It looks neat, and it won’t intrude on your neighbor’s property, even if it is right on the property line. A large factor against fences is cost – the generally cost significantly more than a hedge to install, and cheaper options usually need more frequent maintenance, and deteriorate more quickly too. $20 to $40 a foot, installed, can easily be the cost of a fence, which is significantly more than planting a hedge. A second problem is height. While a fence may be a reasonable choice at 4 to 6 feet, a 15-foot fence is a daunting proposition, and very expensive too. A hedge of that size, while perhaps tricky to trim if you need to, is perfectly feasible. Thirdly, some communities require planning permission for fences, but not for hedges. That permission often comes with height limitations, and it may require the consent of a neighbor too, which can be a problem if you want that barrier because of a problem neighbor! Beauty is one of the primary benefits of a hedge – in most cases, once a fence is installed people try to hide it with plants anyway, so why not just use plants from the get-go? That lush wall of green is a garden feature in its own right, and many people take pride in their hedges in a way they never would with their fence. Then there is the quality of the screening. While a hedge creates a visual barrier, it does little else. A living hedge filters out noise, dust, air pollution and wind, while a fence can often increase wind speed, and doesn’t reduce noise very much either. This is an especially important benefit if you live along a highway, where a hedge really can bring tranquility, and create a micro-climate for gardening behind it. In summer a hedge even has a cooling effect, as moisture evaporates from the foliage, cooling the air as it does so. Remember that 10 to 20-year life for a fence? It sounds good at the beginning, but as they say, time flies, and you could be ready to sell your property just when that fence needs replacing. A broken-down fence is a big negative to buyers, and you might find yourself having to invest in a new one. A hedge, on the other hand, will just be getting into its stride, and will look great after 20 years, if it has been well-maintained. Another benefit of a hedge is to wildlife. Your hedge is a miniature wild-life sanctuary. Even if the hedge doesn’t provide food directly, it gives nesting sites and protection to birds, which in turn bring you song and excitement. The main problem most people see with hedges is the time it takes to grow, and its maintenance. It’s true that you must wait a while for a hedge to establish, fill-in and reach the height you want, and this is where a fast-growing evergreen like Thuja Green Giant gets into the picture. It has been proven to be the fastest plant on roots, yet it forms a solid, durable and long-lived barrier. In good conditions, and during the early years of establishment, a hedge of Thuja Green Giant can add three to five feet of growth in a single year. So it really won’t be long at all before you have a good visual barrier, and in a few years you will be looking at a beautiful barrier. The other thing often raised is maintenance. People think they have ‘black thumbs’, not green ones, and they will soon kill their new hedge. Others have busy lives and they are not sure if they have the time needed. The good news is that a plant like Thuja Green Giant is very easy to grow. If you put down a simple irrigation line when planting, you can easily take care of watering. With modern slow-release fertilizers, feeding a hedge is a once a year quick job, and with Thuja Green Giant pests and diseases are never a problem – even deer usually leave it alone. As for trimming, if you have a larger garden that doesn’t even need doing at all. 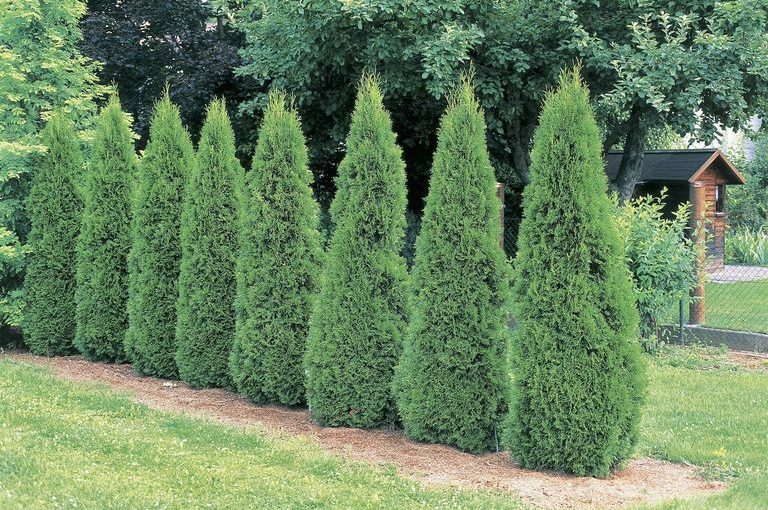 Thuja Green Giant has a naturally dense, upright growth pattern, and forms a solid barrier without any trimming needed. Sure, it will not be that immaculate wall of green, but it is still lovely and green, and does everything a more formal hedge can do. If you do choose to trim, the exercise is great, and you can always hire professionals to do it – consider the money you saved from that expensive fence. There are lots of things to consider, and of course the choice is yours to make. But consider that there is something special about working with living plants, that an inanimate fence can never provide. Of all the hedging plants you can choose, Thuja Green Giant ticks more boxes than any other – which of course is why it is the number one evergreen across most of the country. Hedges are a basic garden feature. They create privacy and a sense of enclosure, providing protection for people and plants from cold winds. So we want them to look good, but often they don’t. Sometimes a careful trim will bring them back, but sometimes an older hedge is too far gone to be saved. How to tell the difference? A hedge should last at least 30 years, and some gardens have hedges 100 years old or more. Partly it depends on the plants used – if they can be trimmed hard back they can have a longer life – but it also depends on the maintenance given, and how the hedge was developed when young. Here are some things to look for that will tell you if time is up for your hedge, or if it can be salvaged. If you do put in a new hedge, some of these problems can be prevented, so your new hedge will ook good for longer than the old one did. There is dead, and then there is dead. If you have brown areas on the face of your hedge, take a closer look and see why. Is the brown all attached to one branch, or is it scattered? Has a plant died, so that all its interlaced branches are now brown? Are there signs of insect damage, or disease? Black, brown or reddish spots on the leaves, or growths on the stems, can indicate a disease. Bagworms will attack some hedge plants, and their nests made of twigs will be visible hanging on the branches. If a whole plant, or several, have died, then once you take it out you will have gaps, which we will talk about lower down. If it is just branches, then often you can remove these, and the surrounding live parts will grow into the spaces in a couple of years or less, depending on their size. Obviously smaller spaces fill more quickly, and you can protect against big gaps from branches dying by trimming in all directions, not just upwards, so that the branches grow out horizontally, not in long sweeps up the hedge. If you have had to remove a dead plant, or perhaps you have an older hedge that has already lost plants, these can sometimes be replaced with new ones. To get back to a perfect, uniform surface you need to know what the plants are, which can be tricky, but if you plant something similar the color and texture difference might just be ‘interesting’ – it depends on what kind of person you are. Plants beginning to die out could be a sign of an old hedge, so it can often be better to replant from scratch than keep trying to fill in gaps. There are two key things for filling gaps – use good-sized plants and dig planting holes that are as big as possible. Set the new plants inside the hedge, so that they can grow out and fill in the space. Don’t plant them on the edge, or they can never grow properly. When you are planting a new hedge, buy a few extra plants and put them in another part of the garden. Trim them when you trim the hedge. Then if you lose a plant or two from your hedge, you can use these spare plants. They will match perfectly, be the same age, already have some density and structure, and be used to your garden. It makes sense. This is a classic problem with hedges that have been trimmed badly. There really is no simple solution on an established hedge, so if you need that coverage and privacy it is time to plant a new hedge. This problem develops when a hedge is trimmed evenly all over. The top always grows faster than the bottom, so if you trim evenly it is inevitable that the top grows wider. Then it shades the bottom and steals food reserves, weakening the growth further. Soon the lower branches are dead, and the growth of your hedge migrates to the top. With your new hedge, don’t make the same mistake. The face of a hedge should slope slightly inwards, so that light, water and nutrients reach the lower branches. To achieve this, you need to trim more from the upper parts than from lower down. That’s all it takes, it’s simple, but often not understood by novice trimmers. Over time, hedges grow. It is not possible to keep them to zero growth, although we can get close to it with regular trimming. The less often you trim, the quicker they will grow wide. Suddenly you find your car brushing against the hedge along the drive, or you can’t walk down the path anymore. Beds in front of the hedge become engulfed, and neighbors complain they can’t get down the sidewalk. 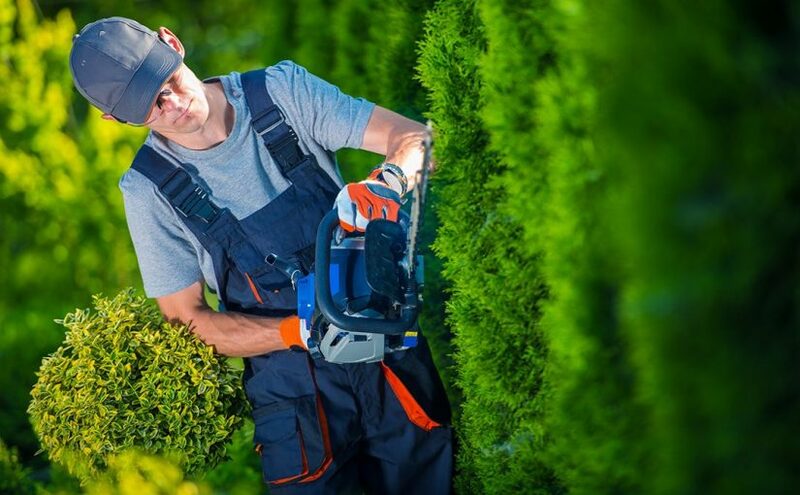 It depends on the type of plant used to make your hedge, but with most evergreens, particularly conifers, like Thuja Green Giant, Leyland Cypress, or Emerald Green Arborvitae, cannot be cut back into branches with no leaves on them. That is why regular trimming – little and often – is the best. If you have a wide hedge, you can cut back as hard as you can, always leaving some green, and then repeat that once it thickens up. This way you can certainly get back a foot or so. If the problem is bigger than that, this is another signal to replant – you will be amazed how much garden space you recover! Some plants, like most broad-leaf evergreens, and conifers like yew trees, can be cut back to bare wood and they will re-sprout. This is why we sometimes see yew hedges that are hundreds of years old. The technique to reduce the spread of plants like this is simple. Cut back one side very hard, leaving the other side alone. In a year or two the cut-back side with have re-sprouted and be lush and green. Now you can do the other side. The whole process takes 3 to 4 years, but its still quicker than replanting. Pity it doesn’t work for everything! For other plants that have outgrown their allotted space, the only solution is to plant a nice new hedge. In last week’s blog we took a look at safe hedge trimming, an important subject for those who value their safety – and who doesn’t? In passing we mentioned ladders, and specifically tripod ladders, a professional tool that should be in every garden. 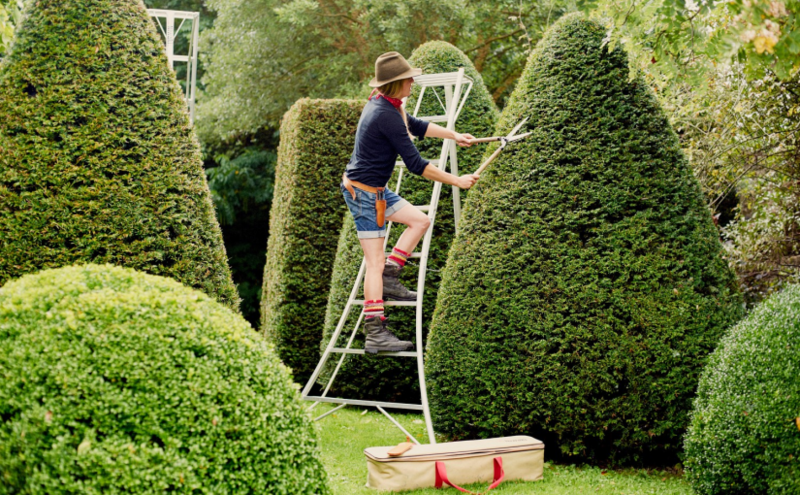 Since it got only a brief mention, it seemed that ladders, so necessary for trimming tall hedges and evergreens, was a subject that needed more discussion. So here we go. . .
What’s Wrong with My Regular Ladder? You probably already have a conventional step-ladder, and if you do use it in the garden you will probably already be aware of the limitations. Unlike a floor, gardens are often uneven or sloping, so it’s difficult to place a step-ladder on the ground without it wobbling. Perhaps you end up placing boards or bricks under the too-short leg(s), but this is an accident waiting to happen, and unstable support is the cause of many falls from ladders. If your hedge runs alongside steps, it is particularly difficult if not impossible to get a ladder on that section, so cutting is made much more difficult. The second problem is getting at the hedge. With four legs you must place the ladder parallel to the hedge, so you are standing facing sideways, instead of face-on. This makes it more difficult, and dangerous, to reach the top and trim it thoroughly. A relatively easy job becomes frustrating or downright impossible. If like most gardeners you have faced these difficulties, you probably thought they were just something you had to live with, unless you were willing to work with adjustable platforms, which are large, slow to erect and take down, hard to move and often impossible in confined spaces. The answer has been around for centuries, but oddly it is largely unknown to American gardeners. In Europe, the United Kingdom and Japan the solution is well-known, but in the USA many gardeners struggle along with their step-ladders, not realizing there is a simple answer – cut off one of the legs. No, not from your step-ladder, Homer. The third leg must be centered at the back, and it is often adjustable in length too. Three-legged ladders solve both of the main problems with using a regular step-ladder in the garden – unevenness of the ground and facing the hedge. These ladders are called ‘tripod ladders’, or sometimes ‘orchard ladders’, because they are also very useful for fruit-picking and general tree pruning, as well as trimming topiary and clipping any kind of evergreen or tall bush. Working around the garden is so much easier with one, and everyone is amazed by their versatility and usefulness, compared to struggling with a conventional step-ladder. With just three legs, as long as the front two are on a level surface, the third one can be anywhere. The third leg can be leaned out at any angle, so for a down-hill slope pull it closer, and for an uphill-one lean it further away. The step section can be kept with the steps horizontal with that simple adjustment. Even easier, many models have an adjustable height on the tripod leg, so by shortening or lengthening it you keep the steps horizontal, no matter where you need to place the foot of the third leg. So uneven surfaces are no longer a problem – you can even use it along garden steps. Even more useful is the ease with which you can slide the tripod leg inside your hedges, making it possible to climb up and face the hedge straight on. Not only is that a much safer working position, it gives you more reach onto the top, and further back. The top step is now right against the hedge, and you can use the trimmers to their maximum extent. Until you try it, you can hardly believe how much easier this is. There is only one situation where facing the hedge can be difficult, and that is on a steep slope, where the two front legs are not level enough for safety, however that is partly compensated for by the design. What is a Tripod Ladder Like? The front of a tripod ladder is designed for safety in the garden. Instead of sides that are parallel, they flare out, so the lowest steps are much wider than the upper ones. This creates a very stable tripod-effect and means that when you lean to one side or another, you are much safer, and there is much less chance of the ladder tipping sideways, even if it has a bit of a lean to left or right. So minor unevenness of the ground under the step legs is not the problem it can be for a conventional ladder. For a steeper slope you do need to face the ladder up or down the slope. The third leg attaches with a hinge just below the top of the ladder, and it can be angled outward without any restraints. This raises the only safety concern. If you have smooth stone or paved surfaces in front of your hedges, then the legs can slide more easily. If the ladder has an adjustable third leg, so that you can keep the angle constant no matter if the ground falls or rises, then the leg will be chained for safety. Some manufactures supply non-slip feet for use on hard surfaces, and these are definitely worth having – and remembering to put on when needed. Tripod ladders are available in height between 5 and 16 feet, usually in one-foot increments. Not all manufacturers will cover the full range. Some have a wider platform on that all-important ‘third step from the top’ which is the safe place to stand when working from a ladder. This is very helpful too, for extra stability and safety. On the third step from the top you can work with both arms free, without danger of tipping over.Go higher and you can fall, like tipping over a balcony with a too-low railing. So Where Can I Buy a Tripod Ladder? If you Google them you will see lots for sale in the United Kingdom, but they can be found in America too. A major US supplier is Hasegawa, with distributors on both coasts. An American manufacturer is Stokes Ladders, who also have a network of distributors. There are others too. Finding a ladder is not going to be much of a problem for you, wherever you live. If you are a serious gardener, you will wonder how you ever lived without one. With the weather warming up, the first trim of hedges, screens and specimen evergreens is on the calendar for many gardeners. Gardening is a great activity, and it is good exercise too, but there are hidden risks. Accidents are much more common than often thought, and although mowing lawns is the most dangerous activity, falls and cuts are alarmingly common too. Trimming hedges and evergreens involves ladders and sharp tools, so it pays to know what you are doing and to take care. Strangely, professionals are trained and often certified to use equipment and tools that home gardeners simply pick up at a hardware and start using with no understanding of the risks, or how to work safely. Don’t add yourself to the accident statistics. Hedge trimmers are potentially dangerous, so make sure you know how to use them safely. The first step is to read the manual and pay attention to the specific safety features of your machine. All three types of trimmers – electric, gasoline and battery – have their own potential problems, and if you aren’t aware of them accidents are more likely. Keep equipment maintained and sharp – clean your machine after use. Prepare it properly for winter storage. Lubricate as needed. Have the blades sharpened regularly. Depending on your machine, you may be able to learn how to do that correctly yourself, or you can take it to a professional. Sharp tools are no only safer, as they are less likely to snag, but they make clean cuts, so your hedge will look better too. Check all cords and plugs – never use an electric trimmer with a damaged cord, or loose plugs. Even in a short-circuit doesn’t kill you, the shock can throw you off a ladder. Never work with electricity in damp weather – if you live in an area where damp and rainy weather is common, a gasoline or battery machine may be a better choice. Switch off when moving around – unplug your trimmer if it doesn’t have a safety lock. Stop a gasoline engine. Walking around or climbing ladders with a running machine is an accident waiting to happen. Store in a secure place – children are fascinated by tools. Make sure they can’t get at the trimmer by storing it in a locker or locked shed. Just as important as keeping the tools themselves safe, is using them safely. Never be in a hurry – that’s when accidents happen. Take your time, get into the correct positions to work, operate tools safely, and wear safety equipment. Wear safety goggles and gloves – flying particles and dust can get into your eyes. That happening suddenly can distract you and cause an accident, and of course the particle in your eye is already an accident. Wear gloves that give you a better grip and protect your hands. If up a ladder, wear a hard hat – professionals do it, and you can too. A hat with an integrated face shield is more comfortable than goggles. Keep your feet safe – don’t work in bare feet or flipflops. When standing on the ground you can carelessly lower the tip of moving trimmers to your feet. Wear sturdy outdoor shoes – you will have a better grip on the ground, and less chance of slipping too. Always keep both hands on the trimmer – this is a big one. Trimmers have a grip for the second hand – use it all the time. Not only does it allow you to balance the weight, reducing strain, but you can’t accidently get your free hand in the blade if you don’t have a hand free. If you need to stretch out single-handed to trim, move your position instead. Never touch the blade while plugged in – never, ever carry a trimmer by the blade. Never try to remove something jammed in it without first unplugging or turning off. Only cut thin branches – if it has been a while since you trimmed, some of the branches you need to cut may be too thick. Don’t try to hold one end with one hand, while operating the trimmer with the other, as a way to cut it. Carry hand pruners – in a holster – and use them to cut anything too thick for an easy cut with the trimmers. Standing on the ground and trimming is one thing – working off ladders or platforms is another thing altogether. Stay on the ground – the safest approach is to invest in extendible trimmers with enough height to trim from the ground. If the blade can be tilted at an angle you can even trim the top from the ground. As well as being much safer, it is a lot faster and easier working from the ground, so you save time and effort too. Use a tripod ladder – If you need to use a ladder, regular step-ladders are not ideal. Tripod ladders, also called orchard ladders, with flared bases and a single back leg, are much safer. The flared base reduces the chance of tipping, and the single leg allows you to put the ladder facing the hedge, instead of sideways. The tripod leg fits right inside the hedge. This is a much easier working position, especially for trimming the top. If you have trees to prune too, you will find that so much easier with a tripod ladder. These are the choice of professionals, but strangely rarely used by home gardeners. Stop the feet sinking in the ground – on soft ground the feet of a ladder can easily sink in. If that happens when you are up it, the ladder can easily tip. Have a board of a suitable size to place underneath the feet. Not only will that prevent sinking, it will give you a more stable base. Have a few small pieces with you to level it as necessary. Tripod ladders don’t have an anchor on the third leg, and usually don’t need support – they are designed for soft surfaces, and they can be dangerous if used on asphalt or pathways. Have a regular step-ladder as well for those situations. Never climb an unstable ladder – always keep the base of a ladder horizontal. If it is crooked it will tip with your weight on top. Falls are a major gardening accident, and they can be serious if not fatal. All these things are common sense, but it is amazing how often people get themselves into dangerous situations. Bravado and taking risks seems to be a ‘guy thing’, but staying alive, with all your fingers attached, is a ‘guy thing’ too!